You'd think he was an American! Seriously, tho, what's going on in London this weekend? Auto - do you know the answer to this or can you give me some idea of how i might be able to find the answer? 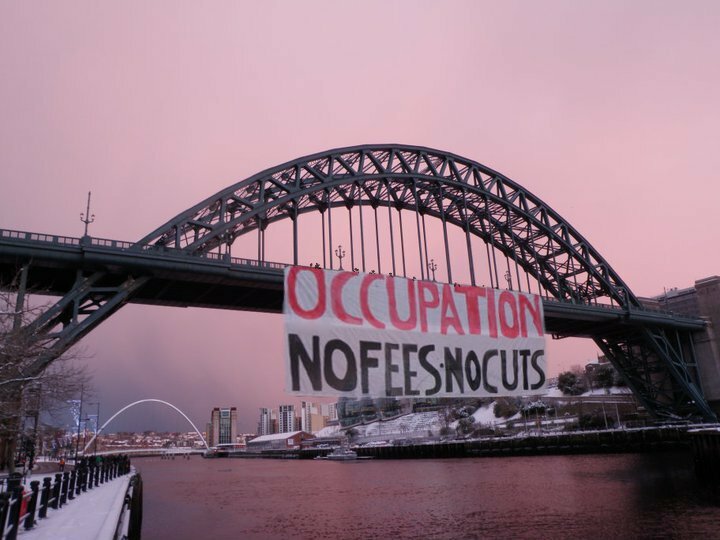 @Samotnaf - there is a @sladeoccupation twitter account - you could ask them directly via that maybe. The UCL occupation has an eviction notice as of an hour or so ago. Official eviction time is 2pm Friday. Also while I'd love to be proved wrong, I'd put money on the staff at Slade being exclusively lecturers. I'm just headed there now. Was there earlier today and looked all right, smallish sit in of about 40 students. Will post further updates as soon as I have more idea what's going on. Newcastle Civic Centre has been occupied. Southbank occupiers won their demands. Language centre is reopening and all jobs reinstated! Did a quick Google search but I didn't find anything. Anyone have any further info? It is understood anarchists from Italy, Germany, Spain and Latvia were among the militants who brought mayhem to the capital. Others came from as far away as Argentina, arrived in London at least a week before the protest and were involved in planning the attacks on the Treasury and the Palace of Westminster, The Mail on Sunday has learned. Some are thought to belong to an anarchist group called Black Bloc, which originated in Holland and Germany, and has taken part in riots all over the world. and 350 years ago, this Blac Bloc was called by the Daily Mail's ancestors "the Jesuits"